How easily do you trust other people? What is it that determines your ability or inability to trust certain individuals around you? Do you feel people need to earn your trust? Or are you willing to extend trust ‘unearned’? 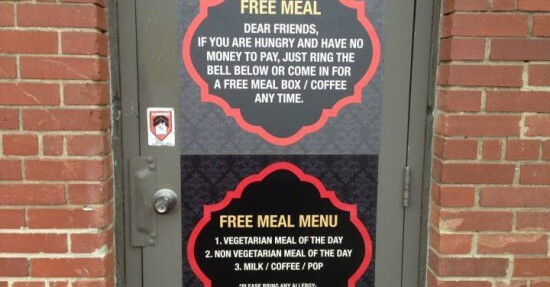 An Edmonton, Canada, restaurant is gaining international attention for its efforts to help feed those in need. Indian Fusion is a small, family-run restaurant with fewer than ten tables, but it’s making a big difference for the homeless. This is no publicity stunt. They trust people understand their motives. Acknowledge the importance and complexity of trust in our lives, our work and our relationships. Trust is one of the most critical elements of healthy relationships, families, teams, and organizations. However, many of us have an odd or dis-empowered relationship to trust. We’ve been taught that people must earn our trust, when, in fact, it’s something we should be willing to grant to others. The life many of us have experienced tells us that it isn’t always safe to trust people – maybe we had a less than ideal upbringing, perhaps we had a tough time at school, or in some difficult situation without adequate support, and part of what we get used to as children is to be suspicious of just about everyone we come into contact with. While this may serve us to a degree as we progress to adolescence (at least in terms of survival), but when we become adults, resistance to trusting others creates real issues in life and relationships. We each have our own internal process about trust, much of which is based on past negative experiences. In other words, we get burned, disappointed or hurt in life and then decide, “I’m not doing that again,” and we put up barriers around ourselves to keep us “safe.” Many who can appear dis-trustful are in reality quite insecure; of their appearance, ability or qualifications, and many other factors the other party may not have any clue about. While this makes rational sense, it usually leaves us guarded, suspicious and insecure, unable to easily create meaningful and fulfilling relationships with people. The irony is that no matter how guarded we are, how thick the walls we put up, no matter what we do to try to keep ourselves from getting hurt and disappointed, it will likely happen anyway, a ‘self-fulfilling prophecy’. What if we granted our trust more easily? What if we were willing to make ourselves vulnerable, to count on other people in a genuine and healthy way, and to expect the best from others authentically? Michael Bernard Beckwith calls this being “consciously naïve,” which may seem a little contradictory on the surface, but at a deeper level is a very profound concept. Will we get hurt? Yes! Will we be let down? Certainly. Will people violate our trust? Of course. However, this will happen anyway — it’s just part of life. The more we are willing to grant our trust consciously, the more likely we are to create a true sense of connection, cooperation and collaboration in our lives, relationships, families, teams and more — even if we feel scared to do so or it seems counter-intuitive at times. People have a habit of living up to expectations. When trust breaks down, what problems result? They are many. Each person assumes the intentions of the other are negative, scepticism, suspicion, and ultimately paranoia sets in, and even if the other person tries to put things right, the damage is done. Managers become micro-managers, employees become fearful of acting without permission, rules and bureaucracy dominate the workplace. Managers quickly confuse their personal interests with those of the company. In the end it all depends on your perspective as to whether or not to give trust freely. Trust is only measured by the value that we ourselves place on it. No matter how many “tests” you may put people through in order to have them “earn” your trust, at the end of that process, it is still up to you to grant them trust (or not), and then to continue to trust them (or not). We know it feels good when someone displays trust in us but we have only intuition, a gut feeling, as a way of “measuring” how much the other person has entrusted us. Only the person trusting us can gauge how well or to what extent the trust has been maintained or violated. When considering relationships, that ‘gut feeling’ matters a great deal.